Black and white is a pattern that never fail. I want it looks like as cute as panda. 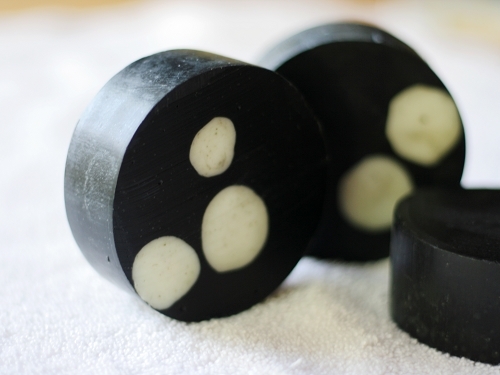 Using the Bincho Carbon powder soap from previous one to rub into small balls to make this soap. A perfect soap for Valentine. 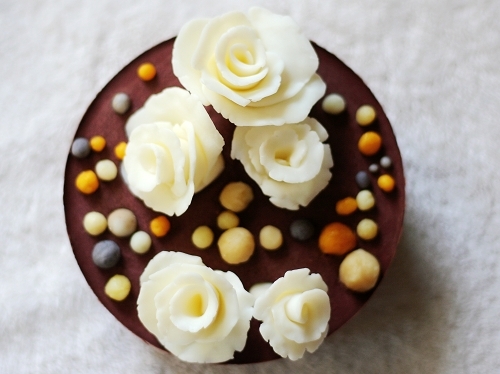 I like the combination of red clay and rose oil. 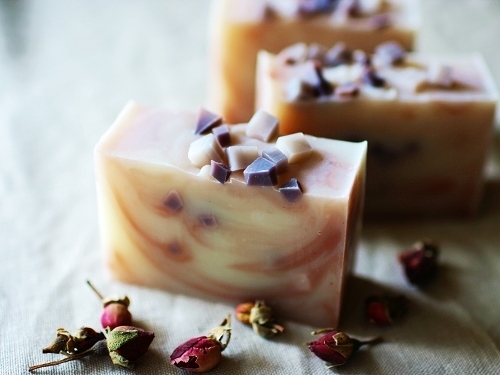 This soap is gentle to skin and the red clay draws excess oils from the skin and stimulates circulation. 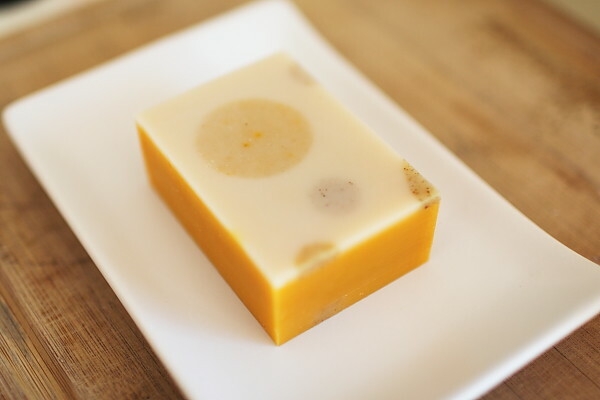 After I tried Orange Suqare, I found it is not too hard to make square soap. I like to try again. 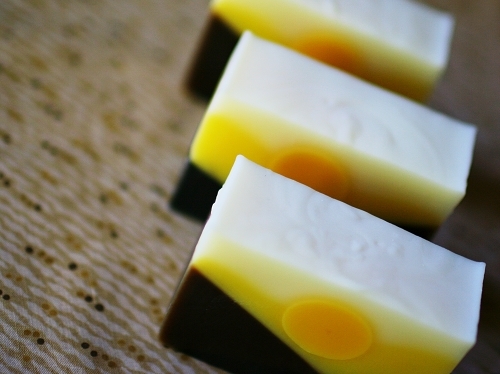 The part of three-layer was done at the same time with the previous one. I grinded oatmeal so it will not too scratching on skin. 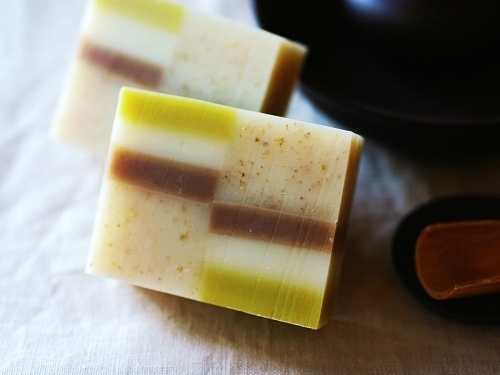 It has been a long time that I didn't make scrub soap. Sweet almond meal is a good ingredient as exfoliant. 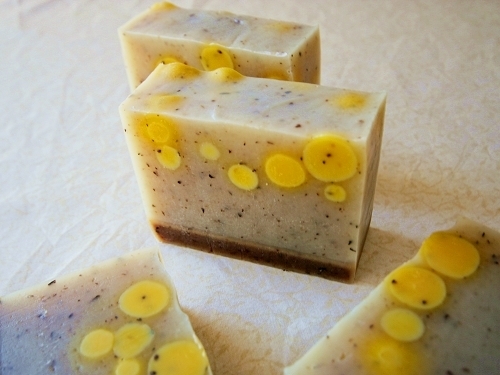 This soap not only had sweet almond meal, but also mixed with 20% swee t almond oil. So it will clean and exfoliate skin and moisturize skin as well. 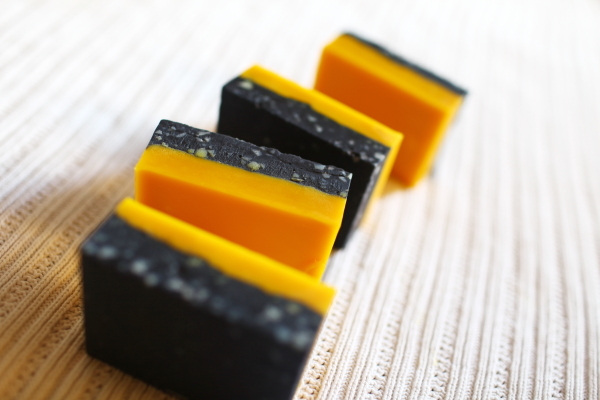 It is said that the Bincho Carbon powder soap is very good for the face with acne. OK, that's my face. Hopefully it can help. I used pepper mint water to dissolve lye. It is full of sweet pepper mint smelling! 1% of Bincho Carbon powder was added. 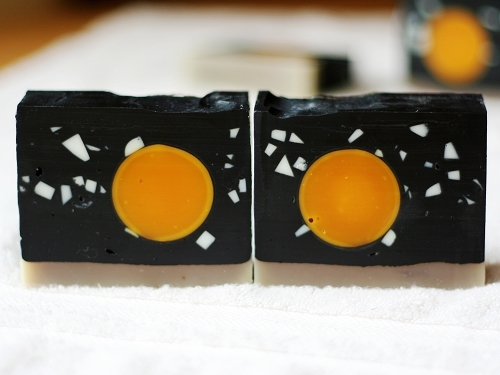 The whole soap is really black. 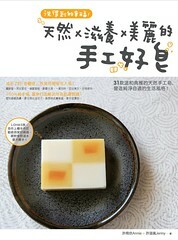 After I try this soap, I will report if my face has improvement. 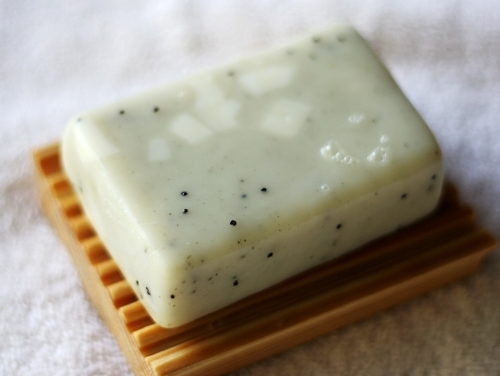 Want to make a soap looks like a kiwi fruit─green soap base with white cube soap in the middle, scattering some poppy seeds as kiwi seeds. 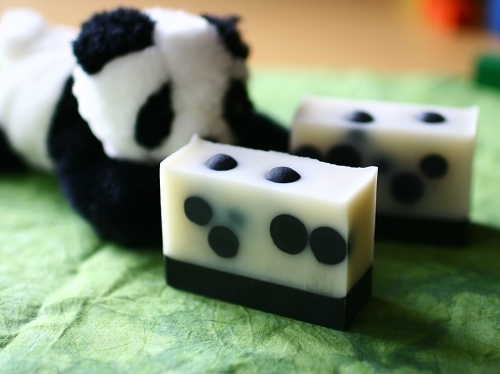 Obviously, the soap dose not look like the way I want. 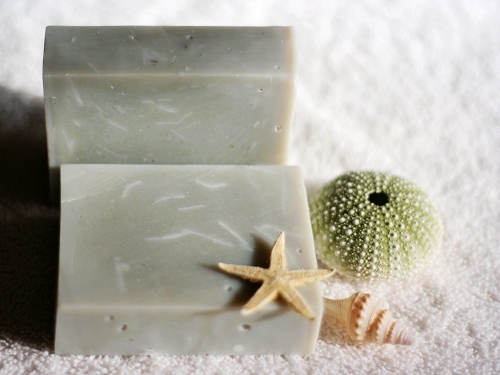 But, the green clay plus avocado oil still a good soap for deep clean. 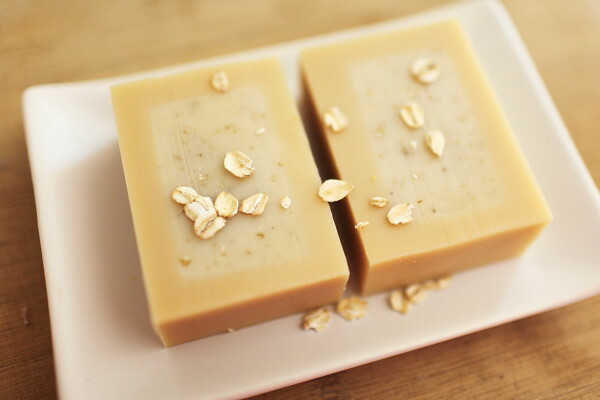 My skin feels very smooth and soft after using soap with oatmeal. Oatmeal is one of popular breakfast in my family. This time, I will make it even sweeter! 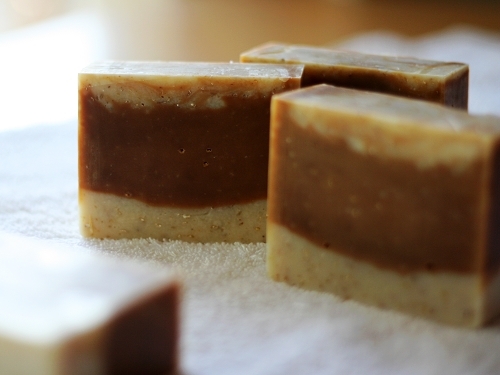 Added some grounded organic rolled oats in my Castile soap recipe. 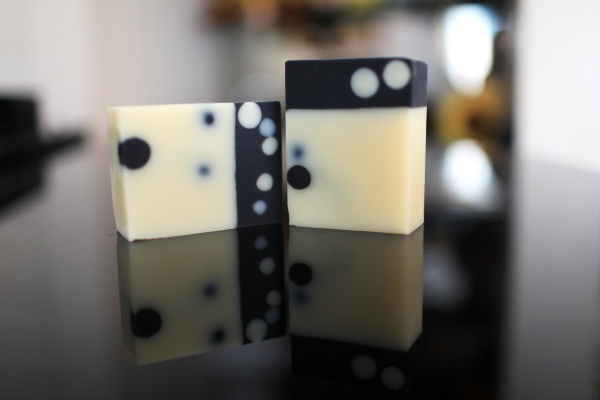 Enriched nourishing kuikui nut oil to give more moisturizing to skin and the fragrant black molasses speckled the soap.